16 years ago the first set of Holy Traders® saint trading cards entered the classroom. They've been featured in Our Sunday Visitor, Catholic Digest, and the Knight's of Columbus Columbia Magazine. Every card features a Saint or Feast day from the Church calendar and includes a short biography, statistics, and a brief catechism. Parents and teachers use the cards for rewards and incentives for work completed or prayers learned. Children organize and display their collection of colorful glossy cards in the included binder's clear pages. You'll be amazed at what kids will achieve to complete their collection! Holy Traders are Guaranteed to Capture Your Students' Interest! Set # 1 contains 30 cards from the original 1994 issue. Includes St. Francis of Assisi, St. Vincent de Paul, and St. Maria Goretti. Also contains the pre-canonization cards of Sts. Faustina, Josemaria Escriva, and Edith Stein. The cards of Set #1: St. Angela Merici, Sts. Anne & Joachim, St. Clare of Assisi, St. Dominic Savio, St. Dymphna, Bl. Edith Stein, Bl. Faustina, St. Francis de Sales, St. Francis of Assisi, St. Gabriel Archangel, St. Elizabeth Ann Seton, Immaculate Heart of Mary, St. John Bosco, St. John Vianney, St. Joseph of Cupertino, Bl. Josemaria Escriva, Bl. Junipero Serra, Bl. Laura Vicuna, Bl. Ledochowska, St. Patrick, St. Maria Goretti, St. Martin de Porres, St. Mary Mazzarello, St. Maximilian Kolbe, St. Michael Archangel, St. Peter Claver, Bl. Pier Georgio Frassati, St. Thomas Apostle, St. Thomas More, and St. Vincent de Paul. Set # 2 Issued in 1995, Set # 2 includes St. Rose of Lima, Bl. Charles Lwanga, and St. Jerome Emiliani Patron of orphans and abandoned children. Also contains the pre-canonization cards of Sts. Jeanne Jugan and Katherine Drexel. The cards of Set # 2: St. Agatha, St. Bernadette, St. Catherine of Siena, St. Catherine Laboure, St. Charles Lwanga , St. Dominic, St. Edmund Campion, St. George, St. Hallvard, Bl. Jeanne Jugan, St. Jerome Emiliani, St. Joan of Arc, Bl. Kateri Tekakwitha, Bl. Katherine Drexel, Bl. Miguel Pro, St. Pierre Eymard, St. Peter Donders, St. Rita of Cascia, St. Rose of Lima, St. Sharbel Makhlouf, St. Teresa de los Andes, St. Teresa of Avila, St. Thomas Aquinas, St. Thomas Becket. Set # 3 contains 24 cards and includes St. Crispin of Virtebo (Pope John Paul II's 1st canonization), St. Josephine Bakhita , and St. Gemma Galgani. Also contains the pre-canonization cards of Sts. Gianna Molla, Padre Pio, and Juan Diego. The cards of Set # 3: St. Andrew Kim, St. Augustine, St. Camillus, St. Clelia Barbieri, St. Crispin of Viterbo, St. Elizabeth of Hungary, St. Gemma Galgani, St. Gerard Majella, Bl. Gianna Molla, St. Josephine Bakhita, Bl. Juan Diego, St. Longinus, St. Lucy Filippini, St. Marguerite d'Youville, Bl. Maria Assunta Pallotta, St. Maria Josepha Rossello, St. Maria Soledad Torres-Acosta, Bl. Marie-Anne Blondin,, Our Lady of Czestochowa, Bl. Padre Pio of Pietrelcina, St. Peter Apostle, St. Raphael the Archangel, St. Tarcisius, and St. Vincent Pallotti. Set # 4 contains 24 cards and features Bl. Mother Teresa, Blesseds Jacinta and Francisco Marto, and St. Philomena. The cards of Set # 4: St. Agnes, Bl. Bartholomew Longo, St. Bernadine of Siena, St. Bridget of Sweden, Bl. Francisco Marto, St. Elizabeth, St. Ignatius Loyola, Bl. Jacinta Marto, St. John Eudes, St. John the Baptist, St. John the Evangelist, St. Joseph, St. Louis de Monfort, St. Mary Magdalen, Bl. Mother Teresa, Our Lady of Vladimir,St. Philomena, St. Simon Stock, Bl. William Chaminade, and also, the Luminous Mysteries: Baptism in the Jordan, Wedding Feast of Cana, Proclamation of the Kingdom of God, Transfiguration, Institution of the Eucharist. 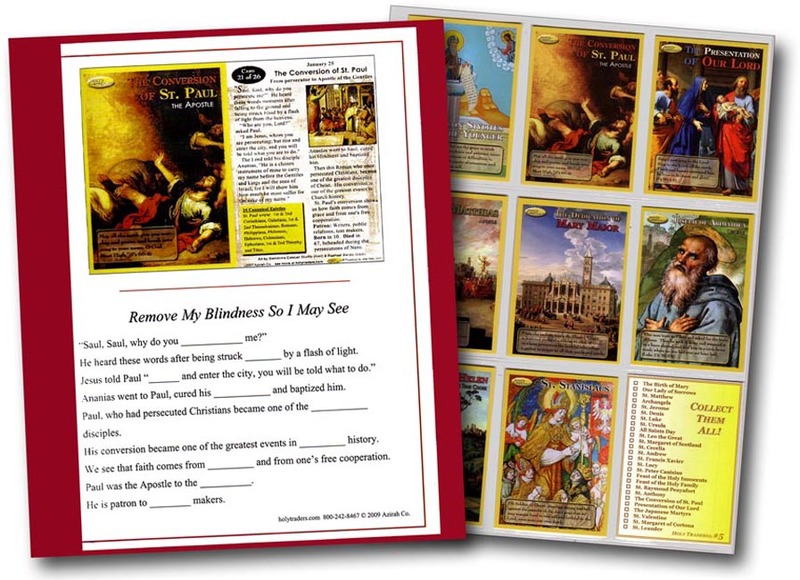 Set # 5 features 26 cards, including St. Matthew, St. Francis Xavier, All Saints Day and The Conversion of St. Paul. The cards also display beautiful religious art on both front and back from classical artists such as Raphael, Giotto, Murrillo, Reni, Lippi, Fra Angelico, Zurbaran, Saraceni and many more! The cards of Set #5: The Birth of Mary Mother of God, Our Lady of Sorrows, St. Matthew, The Feast of the Archangels, St. Jerome, St. Denis, St. Luke, St. Ursula, All Saints Day, St. Leo the Great, St. Margaret of Scotland, St. Cecelia, St. Andrew, St. Francis Xavier, St. Lucy, St. Peter Canisius, The Feast of the Holy Innocents, The Feast of the Holy Family, St. Raymond Penyafort, St. Anthony, The Conversion of St. Paul, The Presentation of Our Lord, The Japanese Martyrs, St. Valentine, St. Margaret of Cortona, and St. Leander. Set # 6 features 26 cards, including St. Aloysius Gonzaga, Sts. Perpetua & Felicity, the Dedication of Mary Major Basilica in Rome, and the pre-canonization card of St. Damien of Molokai. The cards also display beautiful religious art on both front and back from classical artists such as Gozzoli, Zurbaran, Panini, Vermeer, Caravaggio, Rembrandt, Tiepolo, van den Hoecke, Fra Angelico, Gentileschi, Jordaens, and many more! The cards of Set # 6: Sts. Perpetua and Felicity, St. Simeon Stylites the Younger, St. Frances of Rome, St. Joseph of Arimathea, St. Catherine of Sweden, St. Francis of Paola, St. Stanislaus, St. Benedict Joseph Labre, St. Mark the Evangelist, St. Zita, Blessed Damien of Molokai, St. Matthias, St. Philip Neri, St. Norbert, St. Barnabas, St. Aloysius Gonzaga, St. Cyril of Alexandria, St. Elizabeth of Portugal, Augustine Zhao Rong and 119 Companions, St. Francis Solano, St. James the Elder, St. Martha, Dedication of Mary Major, St. Lawrence, St. Helen, and St. Monica.